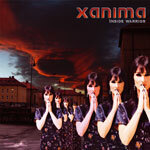 Lion Music's latest discovery, Xanima, is quite different from their regular stable of artists. The core of Xanima is accomplished composer and vocalist Jade Ell and producer Pelle Handen (keyboards and synthesizers). Billed in the promo material as progressive rock, the music of Inside Warrior is combination of pop-rock-electronica with elements of symphonic mixes; the focus is decisively on Ell's vocals and Handen's complex electronic arrangements. The result are songs that can range in feel from pop-rock (The Essence of Being, The Deed And The Damage Done) to ambient hip hop (Into The Lens) to Euro-dance pop (Caged) to true prog/art rock (Exodus, So Fragile). However, the arrangements are mostly thick with strong vocal arrangements, overindulgent synthesizer, keyboard and sampling use, and a predominant pop/dance groove. The first is enjoyable; the rest became wearisome and monotonous midway through Inside Warrior. In the end, Xanima does not fall in the art or progressive rock formula. But the album art is really cool. With Xanima the arrangements are mostly thick with strong vocal arrangements, overindulgent synthesizer use, and a predominant pop/dance groove. The first is enjoyable; the rest became wearisome and monotonous midway through Inside Warrior.